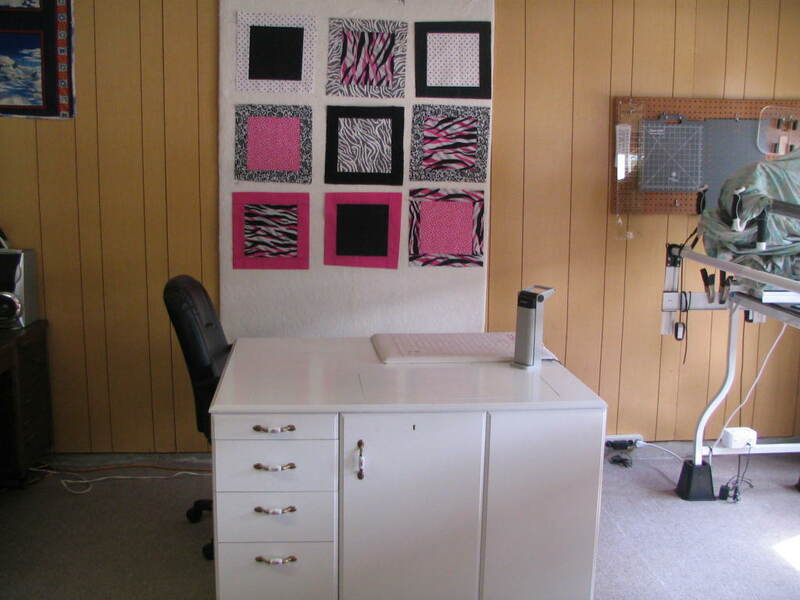 Well after 3 weeks I finally moved into my quilting/sewing garage, room, studio (whatever). It's nothing fancy but I have so much more room. Wife was so happy to get the quilting machine and frame out of the living room. I still have to put the trim around the ceiling and two side doors plus paint the door that the a/c sits in. I don't have a lot of storage yet but will get that next. Wife asked me today if I was going to get all of my stash out of the house and I said eventually. 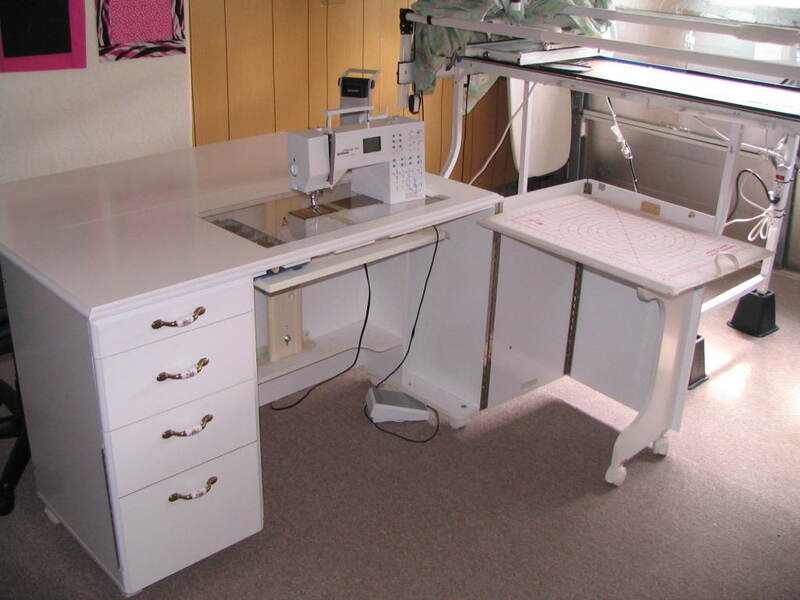 Where my sewing machine sat in the small bedroom of our house was a chore trying to get it moved to set it up. Now I don't have to worry about it. I don't like staring at the things I had to store under the large table so I will eventually put a skirt around it. I also don't like staring at the silver insulation in the garage doors but gotta figure what to do to hide that. I like it. I really love your white sewing machine cabinet. Where did you get it? that is great. I am green with envy. Enjoy!!! I got the cabinet from Sew Contempo in Webster, Texas. It's a Horn brand. You can find them on the internet. Wow, that was a quick makeover and it looks great! Enjoy! Great room David Lucky you. enjoy your space. Congratulations! Nice space! 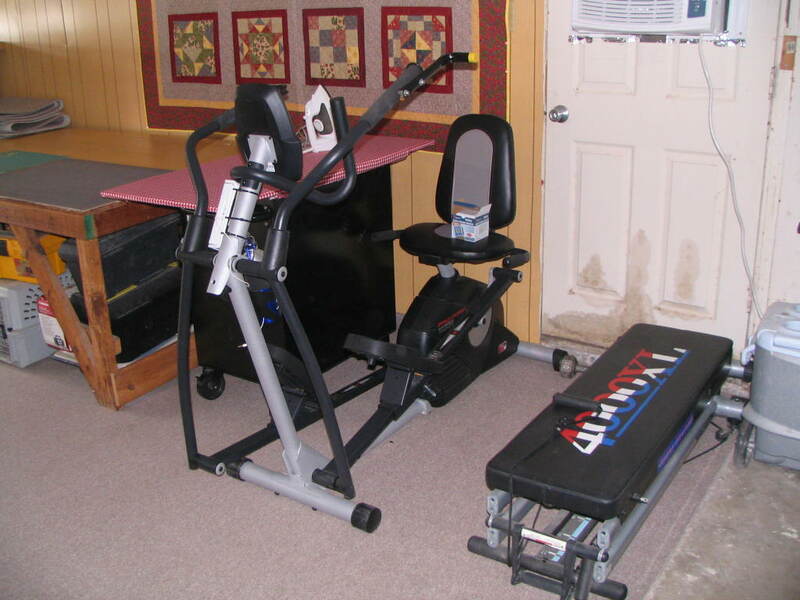 Glad to see I'm not the only one with exercise equipment in my studio. Quick remedy for the silver insulation. you can dip material in liquid starch. It acts like glue, and you can glue it to walls. When you get ready to remove it, it gently peels off like there is nothing behind it. I once did a motorhome walls with that. It was beautiful, and I could easily change material, when I found one that I liked better. Thanks for the tip. Had thought of trying to spray paint it but never thought about covering with fabric. I'll add that to my list. So cool! Your new mam-quilter-cave?! Have fun playing! 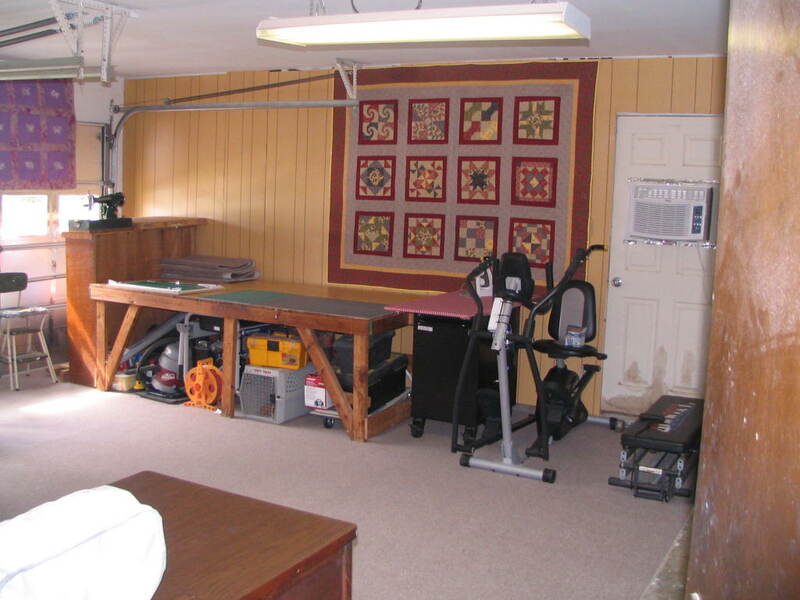 I started making a new quilt yesterday in my new quilting garage. Oh my goodness. I can't believe how much better it is to have all of this room. 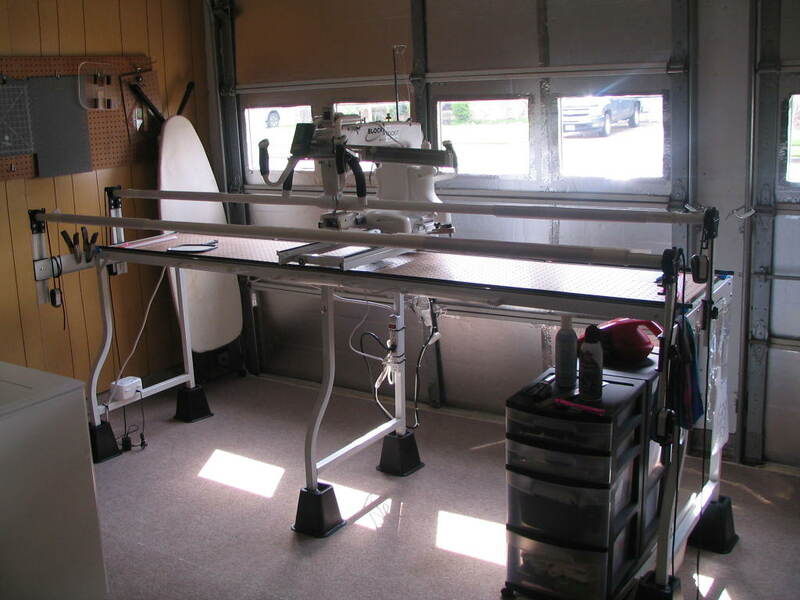 Not cramped up like I used to be...plenty of cutting room on the 4'x8' table....love the new ironing big board I made. Found curtains at the resale shop for $7.00 and by cutting them in half length wise I was able to make curtains to go over the windows in my garage doors....I hung them with Velcro so that I could raise them easily for my wife to look out the windows when I'm not sewing or quilting. Had enough left over to make a skirt for the large cutting table. I just put my music on and get lost in my own little world out there. Very nice! The rolling ironing station is wonderful! Have fun! That is an awesome studio! 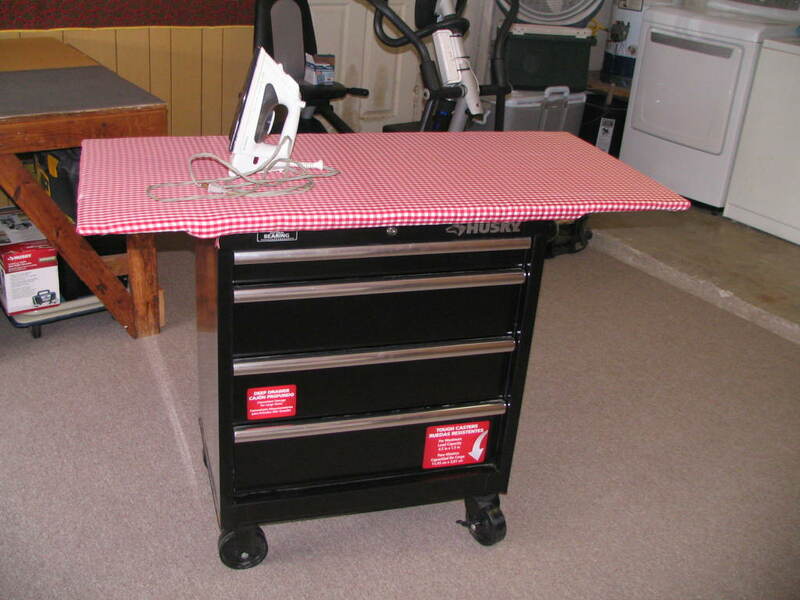 I LOVE your pressing/tool storage table! I also like your sewing/cutting table "L". I made a huge height-friendly cutting table that was so great at first but I've found that I tend to clutter it up, having so much space! I'm actually dismantling it today in preparation for delivery of a new frame for my Nolting 18" IS2kn. I'm going with a smaller cutting table now. Oh I would just die to have a garage! It would be a dilemma though--quilt studio or put my new Jeep in it? I reluctantly sacrificed my last Jeep after 20 years of daily driving because of rust. My quilt studio is in the room formerly known as my dining room, LOL. So no more dinner guests at my house and I just slum around and eat in front of the TV, haha. Love you r new space David. It is awesome. You will enjoy it so much. I've been wishing for a large ironing board. Love your idea. I think I will share this with my sweet hubby but I don't think he will let me have his rolling tool box! He just came in and is going to make me one on a rolling cabinet I have! YeH. It will be 55 by 22 inches!!!!! My guy is the greatest!!!! 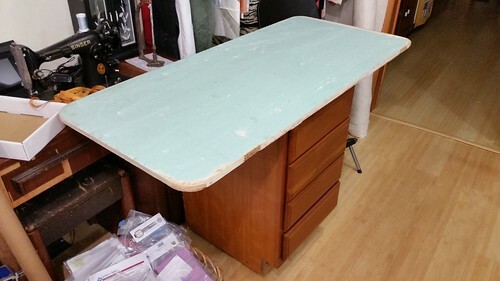 Okay I showed my sweetie your wide ironing board just as I was typing to post to the forum. So he looked around my studio and added a top to my ruler cabinet. What do you think? Now I need to made a cover. I'm so happy! Your husband should get a special dinner for that. He did a really great job on it. I love mine being on casters. I can just move it around anywhere in the quilting room and then put it away for the night. You are going to love your new ironing big board. David, my sweetie is so special and he is well taken care of. My little cabinet is on casters too. He made the top to slide on and tightens with a knob so it can be removed and set aside. I think you and I are so lucky to have our own quilting space. My 3' by 3' area in the dinning room was just too small! I want one!! It looks great!